Amir Khusro (1253-1325 ) - is the iconic Indian Sufi poet regarded as the father of qaqwalis and ghazals He is also the originator of various styles of Indian classical music including the Khayal and the Tarana. This 3 CD Collectors' Edition showcases some of his finest works rendered by a lineup of leading artists including the legendary Mehdi Hassan Ghulam Ali Sabri Brothers Iqbal Bano and Bilqees Khanum among others. 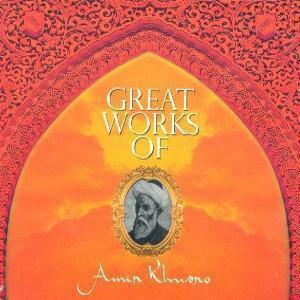 Click the button below to add the Great Works Of-Amir Khusro to your wish list.